The royalty-free license for using Docotic.Pdf library in one desktop application. The Application License allows you to redistribute Docotic.Pdf with a single desktop application to an unlimited number of seats. We do not sell developer licenses. The license cost is fixed and does not depend on the number of developers that use it (all developers use the same license). The license is bound to the attributes of the application (see FAQ below). Any new version of Docotic.Pdf released within 12 months since your purchase can be used by you free of charge. Any upgrades after 12 months from the date of purchase are subject to additional fees (50% of the regular price). After your purchase you will receive a temporary license key. In order to be able to generate a permanent license key for you we'll need to know the Company and Product attributes of your entry assembly. Where can I get attributes of the entry assembly? The entry assembly usually corresponds to the main EXE file of your application. Note that you can use Docotic.Pdf from a DLL, but the license is based on the attributes of EXE that loads this DLL. 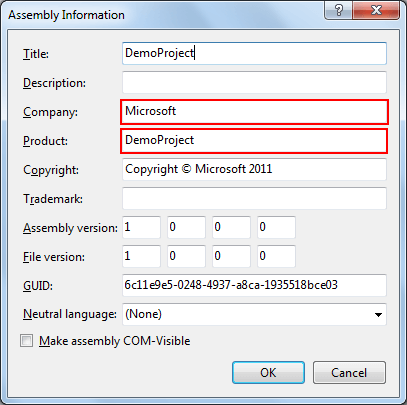 You may find the required values in the "Assembly Information" dialog of Visual Studio. Can Docotic.Pdf be used from VB6, C++, or other unmanaged applications? Yes, Docotic.Pdf can be used by unmanaged applications too. In such a case the license is bound to the value returned by the Process.GetCurrentProcess().MainModule call and attributes of a calling assembly. Is it possible to use Docotic.Pdf for Windows RT, Windows Phone, or Silverlight apps? No, unfortunately not yet. We are working on support for these environments though. Please drop us a line and we will notify you when such support will be implemented. We do unit tests in my company. Shall I purchase an extra license for that? No, using the library in unit testing environments does not require licenses to be purchased. The library supports NUnit, TestDriven.NET, Resharper, Visual Studio test runners as well as LINQPad. The library works without restrictions in such environments (please let us know if you need support for other testing environments).